The hard waste collection helps residents dispose of larger household items that cannot be disposed of through the regular kerbside collection service. Properties that pay the domestic waste management service charge can access one free hard waste collection per calendar year to dispose of up to two cubic metres of hard waste. Image not to scale, for illustrative purposes only. Book online or by calling (02) 5942 6150.
prior to your scheduled collection. Council aims to reduce waste to landfill and encourages the community to follow the waste hierarchy, where disposal to landfill is the last option. Household items, furniture, books, toys, clothes etc that are still in good order can be donated to a charity or dropped to the Gregadoo Waste Management Centre Tip Shop (open Fri, Sat & Sun). Items such as polystyrene, timber/fencing materials, scrap metal, cardboard, oversized/surplus green waste etc can be recycled or reused if they are dropped out to the Gregadoo Waste Management Centre Transfer Station. Printer cartridges, household batteries and mobile phones are recyclable for free at numerous retail locations and at the Community Recycling Station. 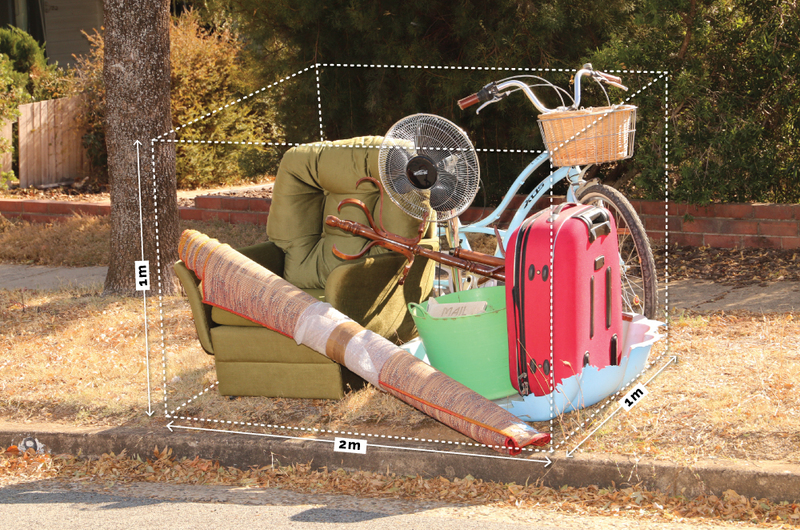 Although landfilling should be the last resort, the above items can still be picked up through the Hard Waste Collection service as long as it meets the two cubic metre size limit.